Here is the sixth page of the vintage cookbooklet “16 Magic Recipes With C and H Magic Frosting Sugar”. Date of the booklet is unknown since there’s no publish date printed anywhere on the booklet. You can view all the pages in this little book by visiting this category: 16 Magic Recipe With C and H Magic Frosting Sugar, just click a page title to view that section of the book. You’ll find a scan of the page included below (click to view a larger size) as well as a typed version for easy printing. Add to sugar mixture and stir until smooth. 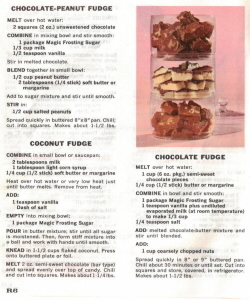 Spread quickly in buttered 8″x8″ pan. Chill; cut into squares. Makes about 1-1/2 lbs. Heat over hot water or very low heat just until butter melts. Remove from heat. POUR in butter mixture; stir until all sugar is moistened. Then, form stiff mixture into a ball and work with hands until smooth. KNEAD in 1-1/2 cups flaked coconut. Press onto buttered plate or foil. MELT 2 oz. semi-sweet chocolate (bar type) and spread evenly over top of candy. Chill and cut into squares. Makes about 1-1/4 lbs. ADD melted chocolate-butter mixture and stir until blended. Spread quickly in 8″ or 9″ buttered pan. Chill about 30 minutes or until set. Cut into squares and store, covered, in refrigerator. Makes about 1-1/2 lbs.